The Intersil 80C286 is a static CMOS version of the NMOS 80286 Microprocessor The 80C286 is an advanced, highperformance Microprocessor with specially optimized capabilities for multiple user and multi-tasking systems. The 80C286 has built-in memory protection that supports operating system and task isolation as well as program and data privacy within tasks. A 25MHz 80C286 provides up to nineteen times the throughput of a standard 5MHz 8086. The 80C286 includes memory management capabilities that map 230 (one gigabyte) of virtual address space per task into 224 bytes (16 megabytes) of physical memory. This is one package pinout of 80C286,If you need more pinouts please download 80C286's pdf datasheet. 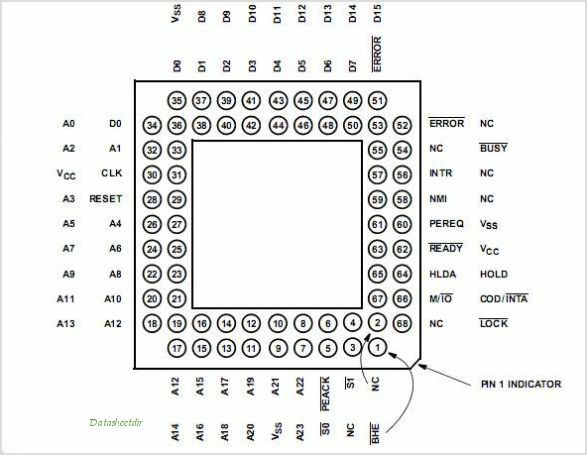 80C286 circuits will be updated soon..., now you can download the pdf datasheet to check the circuits!